Austria is an industrial powerhouse in Eastern Europe, and plenty of profit can be made there if you know who to reach out to. Find the key B2B contacts you need with this Austrian mailing list and grow your business! The Austrian economy is one of the strongest in the world, which makes Austria a place ripe with business opportunity. To get involved in this lucrative market, you need our Austrian mailing list, which contains up-to-date, double-authenticated contact details for important players in the Austrian business community. Gathering the data your sales team needs doesn't have to be an uphill climb when you trust Bookyourdata.com to provide your email marketing lists! There is a no-nonsense approach to business in Austria that fits the email marketing model perfectly. With our accurate Austrian email database, you can establish direct contact with people who have the authority to make purchasing decisions in your target demographic. Each business database we sell contains real, specific contact details, so you won't have to risk sending your marketing messages to "[email protected]" or "Owner" and having them end up in the trash unseen. 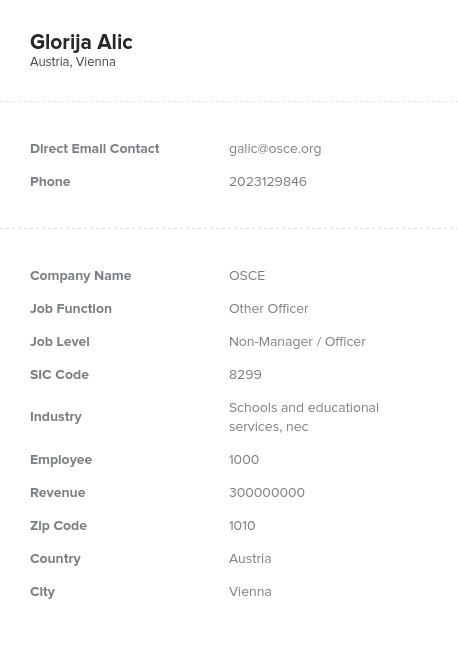 Our Austrian email list has the real names, company information, direct email addresses, verified phone numbers, and accurate mailing addresses you need to get ahead! Looking for a more specific mailing list of Austria businesses instead of this pre-built list? That's not a problem. Just use our list-builder tool to make exactly the business contact list you need quickly and easily. You can filter contacts by industry, company size, job title, and more, so you'll get exactly the data you need to reach out to new sales leads. See the difference that a premium business list can make when you buy this Austrian email database!